There has long been debate among top real estate agents about whether or not realtors should send gifts to their clients. The truth is, client gift giving works since it is a way to differentiate yourself from real estate agents near you that do not gift. Client gifts are an easy and effective way to let customers know you appreciate them. Gifting is also a great way to remind your customers about you, your brand and your company. While the sentiment is typically one of gratitude, you also want your gifts to be gifts that give back in ways that will yield a return on your investment. Ultimately, you are investing in relationship building and lead generation, with the objective of obtaining referrals from your home sellers and buyers. Realtors often view the closing as the only logical time to gift to a client. In fact, nothing could be farther from the truth. Life happens and the needs of your customers change. Having children or becoming the sole caretaker of a parent or loved one can often lead to needing a more adequate living space. Alternatively, a potential home seller or buyer could need to downsize after their children move out on their own. Sending gifts to celebrate a marriage, birth of a child, anniversary or a major milestone are guaranteed ways to ensure you are on the minds of your buyers’ and sellers’. Inspire them to contact you when their needs change or to refer you to someone they know. If you’ve never received a gift at work then you haven’t experienced the excitement of receiving something that isn’t immediately thrown in the trash. Having an unexpected gift arrive at your office is exciting for the recipient and it creates curiosity among colleagues who want to see what their co-worker has received. This interest generates leads when the recipient shares with their co-workers who sent them the gift. There’s truly no better way to increase the shelf life of your investment than by sending a unique gift that includes a keepsake item your recipient can utilize time and again. 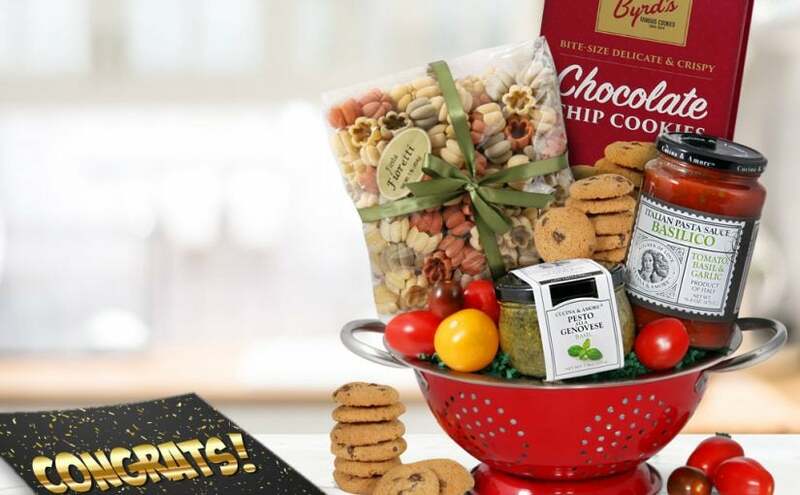 An Italian Dinner Gift Basket with a Keepsake Colander or a Meat & Cheese Platter with a Serving Tray are perfect examples of keepsake gifts that can be used when preparing a meal at home or when entertaining guests. The day your client closes on the purchase of their new home is bound to be one filled with overwhelming emotions. Those emotions will settle over time, but one memory they they won’t want to forget is the excitement of their new home purchase. Capturing a photo of your clients in front of their new home that you can later use to personalize a greeting card to send with their gift will ensure that they can reminisce and cherish that moment forever. If you’ve never implemented a client gifting program, it’s important to know that consistency is key. You cannot expect to yield great results by sending one gift or selectively sending only a few gifts. You wouldn’t be able to grow a forest if you only plant one seed. It doesn’t have to be the same gift every time; you can send something that is appropriate to each life moment. By being consistent with your gift giving, you will lay the groundwork to stay on the minds of your buyers’ and sellers’. For even more tips on how to increase your ROI with gift giving, contact Tim Myers, Real Estate Gift Specialist at GourmetGiftBaskets.com: TMyers@GourmetGiftBaskets.com or (603) 418-7457. Previous Previous post: Why Do We Give Easter Baskets?